I was inspired by Valentine's day happening recently to create a little project to use up some scraps. 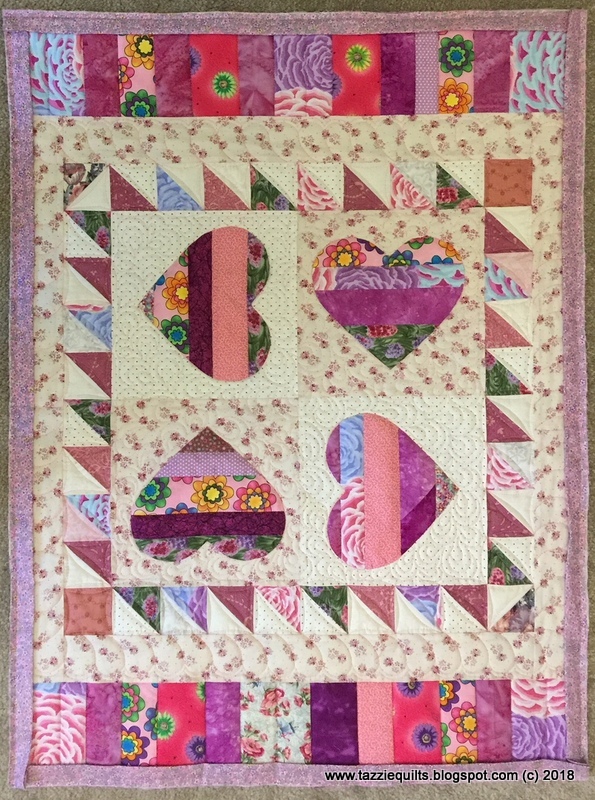 It's fun to put these doodads together for the girls that come to my class, and this small quilt was no exception. Once again, some of these fabrics are from deep stash. A bunch of the pink scraps are from a very early quilt I made for Amy. The pink and red shirting fabric was one I bought from Carolea's Knitche in Sunnyvale on an early trip to the USA. Now I'm guessing that Carolea's has been closed for more than 10 years. Gosh that was a fabulous shop. All that's left to do on this little one is to stitch the binding down on the reverse side, and I'll do that after tennis on Wednesday. I pretty much have my whole week scheduled out - it's amazing how busy life gets, and how fast it happens ... not complaining, just saying! At the start of the year I had such plans to stitch for at least 15 mins a day, keep on top of being organised around the house, and a few other health related things. Can I tell you that the very day that Camo returned to school and all the other tennis commitments kicked in, I totally dropped the ball! Ugh, this was not how I hoped things would be. I'm not saying that my home has turned into a cesspool, it's still tidy - and I'm keeping it that way, but I had grand plans to do more decluttering - and I'll still get there - I guess just at a slower pace. My 15 minutes of stitching each day has amounted to a little unstitching at quilt group last week, and today I stitched a couple of blocks together to see how they look. But, I'm not going to beat myself up about this - and I resolve to do better going forward! Because it's a real oldie, I knew I had little hope of finding it, but in a last ditch effort to hunt some down, I sent out an appeal to my buddies on Facebook. Well, let me tell you that my quilting friends came thru in the best way. A lovely local friend Julie has some that we think is a 100% match, and if that doesn't work out, sweet Rosemary Youngs has offered me some from her stash. My goodness I am blessed with the most lovely friends. So, this evening I decided to put a couple of blocks together to see how it'll look. Oh my goodness wouldn't it be ironic if after all that hunting I didn't like the fabric?!? Never fear, I'm really pleased with it, and the next step was to decide on a fabric for the cornerstones. I have no clue how long it's been in my stash or from where it came, but isn't it lovely? There is only a fat quarter, but I will only need about half of it with such tiny pieces. I am super happy with how this came together- and though the cornerstone fabric looks really bright when you look at the fat quarter by itself, its actually quite subtle when you see that little piece just there. I'm really happy with how the piecing looks, yay!